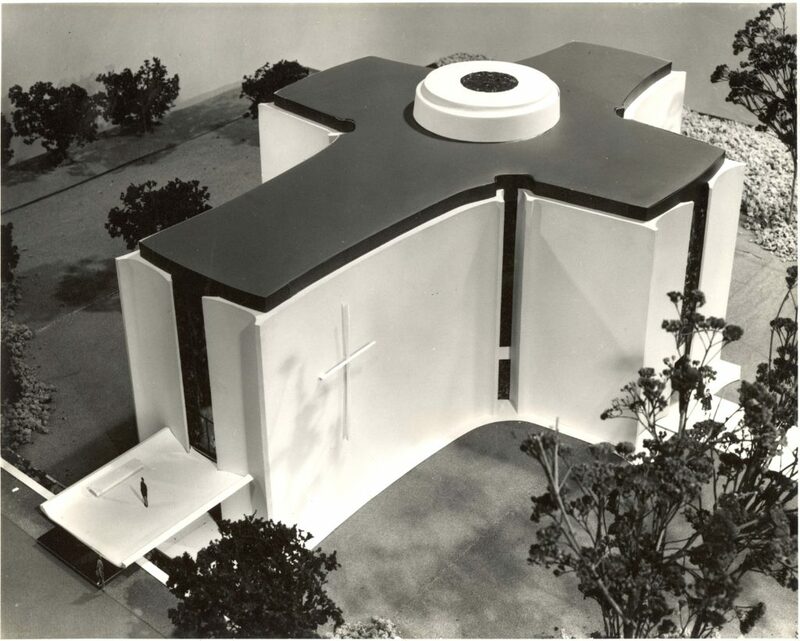 Margaret Brown Herrick Memorial Chapel at Occidental College in Los Angeles is significant not only for its composition, which includes Ladd & Kelsey’s hallmark curvilinear exterior and interior walls but also as Southern California’s first slip-form concrete construction building. Directed by Occidental’s Trustees, Ladd & Kelsey were to design a chapel with the flexibility to accommodate a smaller group of 100 or a larger group of 500. Their cruciform-shaped design resulted from a pragmatic decision to embrace the Reform or Presbyterian form of worship with a central communion table rather than a highly focused altar. This format for human interaction inspired a program featuring two smaller seating bays and two larger seating bays that sublimely met the Trustee’s objectives. The end result is an elegant, intimate experience regardless of an event’s seating program. For further information, visit Herrick Interfaith Center.